The art exhibition was held at Akko Gallery (see map on bottom of page) from Thursday the 10th of October till Saturday the 2nd of November 2002. To immediately see paintings, scroll down below the following text. After having spent ten years in Bangkok, teaching at Assumption University, and at the same time presenting his art work at ten exhibitions, both in Thailand and overseas, Mitree Parahom has finally gone home to his true love, the family farm. 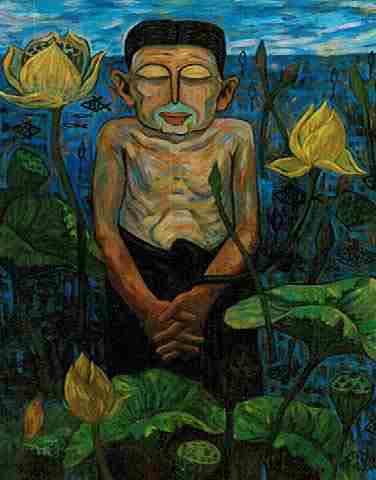 There, in the peace and quiet of his jungle abode -the studio that he built himself- just a short way from the farm, and a million miles away from the hustling greed of Bangkok, he created the exhibition, The Village. 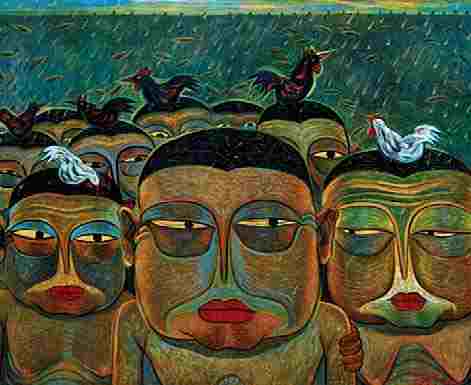 In this exhibition, this dynamic young artist, who has a great following around the world, shows his passion for family and farm and the simple joy of country life in Thailand. He says: "In this setting of peace and serenity, I can concentrate and think about art only. In fact, I am ready to be a complete artist, committed absolutely to my own art, and nothing else." Since returning home, Mitree has gone from village to village, creating oil paintings of the shape of the people and communities. This will be seen in the 35 works he is showing at Akko Gallery, on Sukhumvit Road, in Bangkok, (see map on bottom of this page). For more information, call Atsuko Suzuki at 02 259 1436.